So whilst in NZ (this months residence for yours truly) I’m racing around the Dirty South to all the all the two wheeled ‘freestyle’ events, jams and comps that make up the Month of Mayhem. Last weekend was the Stoney Hills Jam, and in two weekends time it will be the Gorge Road Jam but this coming weekend it is the amazing FREW FARM JAM. New Zealands answer to the X-Games. Check out the Poster and the press release below. Then if you are more interested go to the SFA website or if you are even more interested but patient then look out for some articles im doing on the FREW FARM jam and the other MoM events in Dirt Mag and [R]evolution Magazine. Thats me second from right. About the only jumping we saw in between gale force gusts of wind last year. Sorry about the group email, and hello if you havent heard from us for a while, but we have just had the Poster designed up for ‘The Farm Jam’ which is Southern Freeriders Flagship event, which is to happen on March 6th..
To give you an idea of the scale we are looking at, (if we get fine weather on the day that is), Farm Jam has very quickly grown a huge reputation, officially in its 3rd year, following several low-key Jam’s, we are expecting in our backyard, around 2000 spectators, at least 3 film companies, magaine coverage to come from 6 Industry based Magazines, and our local media The Southland Times, is our best friend. With the help of our amazing Sponsors we have stepped everything up this year, and we are very excited about it, Unit Clothing (www.unitriders.com) from Australia, have continued their unparraleled support bringing some huge sponsorship and also bringing some big name riders over the ditch to compete at the Jam. This year we have also aligned with Red Bull, the involvement with these two companies has brought a huge progression to our ability to take ‘Farm Jam’ to the people of the world! ‘Unit FMX’ – Typically a FMX competition involves a steel ramp and a big pile of dirt to land on, if not an ugly Truck… Farm Jam FMX is a 12 jump circuit all dirt jumps, as well as 2 steel ramps in place for those who want to throw Backflips in their runs! Also included this year is the new jump over the hill, reaching out to a mere 150 foot… We have 12 riders lined up, 4 of whom are coming over from Australia to compete, and then also NZ’s best available talent.. You might have heard of Nick Franklin? ‘Unit MX Race’ – For the first time we are planning to run a Motocross race at Farm Jam, typically not in your traditional form, we wil be having ‘Head to Head’ style racing, around the Jump circuit. This means 1 lap races, 2 riders, going for it! This is guaranteed to be a great spectacle to watch, because these guys can ride! ‘Protec BMX’ and ‘Gravity MTB’ – A wealth of NZ’s best BMX and Mountain Bike talent is congregating this year to test out the new lines at the farm, its gonna get crazy! We have constructed a totally new line of Jumps, 6 jumps in a row with transfer options, leading down into an all new Dirt Halpipe style bowl thingy that will provide some wicked new lines..
‘Reaper / Pitster Pro Pitbike Racing’ – This we are moving the racing to around the main FMX track, obviously not sending them over the ramps, but there will be heaps of action and awesome spectator viewing..
‘Jim Beam Best Trick’ – Best Trick, means best trick of the whole Jam, so will it be a Front Flip on a BMX? Or a superman Backflip on a Motocross Bike? or perhaps a Barrel Roll on a Mountain Bike? Find out on the Day..
‘Slide Best Style’ – Farm Jam is all about making yourself, and the park look good, so ride with style! 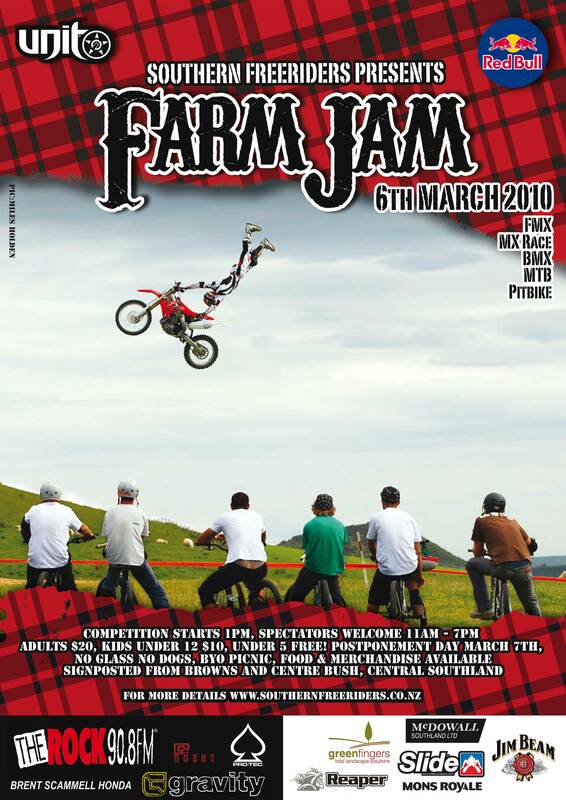 Farm Jam is organised, captured, ridden, and judged by the riders. Its a huge collaboration of of the Freestyle Bike Industry from around Australasia, and March 6 2010 is going to showcase everything that is the Southern Freeriders. To keep an eye on progress, http://www.southernfreeriders.blogspot.com. March 1, 2010 in DIRT MAGAZINE, N-ZHRED, SPOKE MAGAZINE, Uncategorized.